We already know that Batman and Superman were getting their own Hot Toys figures, but now the trinity is complete with the real star of Batman v Superman: Gal Gadot’s Wonder Woman. The 1:6 scale figure features a decent likeness of Gadot as she appears in Batman v Superman, and like almost every female Hot Toys figure, “real” hair as a opposed to a sculpted plastic. It’s not perfect, but it does a pretty decent job of capturing the actress, even if it looks a little off the moment you’re not looking at it head-on. The real star of this Wonder Woman though is her costume. Freed from the cinematic constraints of color grading, it’s been a welcome sight to see Wonder Woman’s cinematic uniform is actually surprisingly colorful, and Hot Toys have done a great job of keeping that color palette vibrant, rather than muting it down to make it look exactly like we see Diana in the film. All the scratches and detailing on her gear and armor are fantastically done, and the texture of everything, from the skirt to her scabbard, really pop. In addition to the mandatory oodles of bonus hands all Hot Toys figures come with, Wonder Woman also gets her iconic lasso of truth, as well as the sword and shield she’s been seen wielding in the trailers, both of which are similarly covered in little dinks and scratches. After all, this is a hero who’s been around for ages in the film’s universe. The battle wear is to be expected! 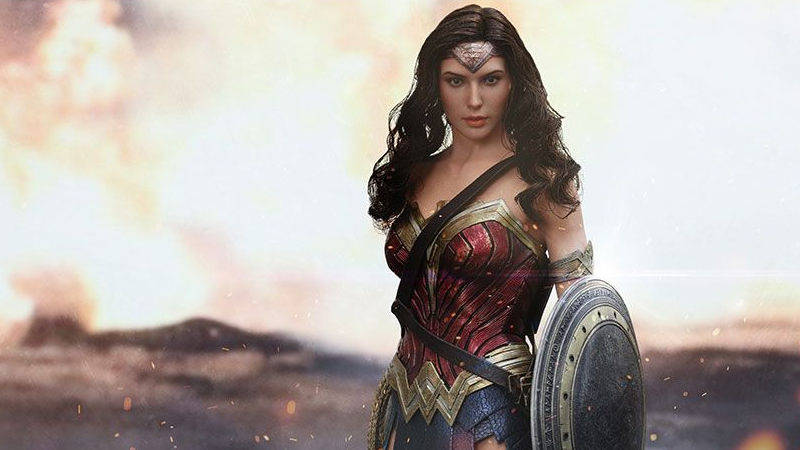 Sadly, it might be a while before we see Hot Toys’ Diana released—the company hasn’t even given a time frame for her release like they have Batman and Superman, but hopefully it won’t be too long. Whenever she’s available, she’ll soon be put up on Sideshow Collectibles to preorder, and you can expect the typical $220-$250 price tag Hot Toys commands if you want one.